This past summer, I quit my job as an academic librarian and moved across campus to the Office of Research and Sponsored Programs, to take a new position as the Research Development Specialist. 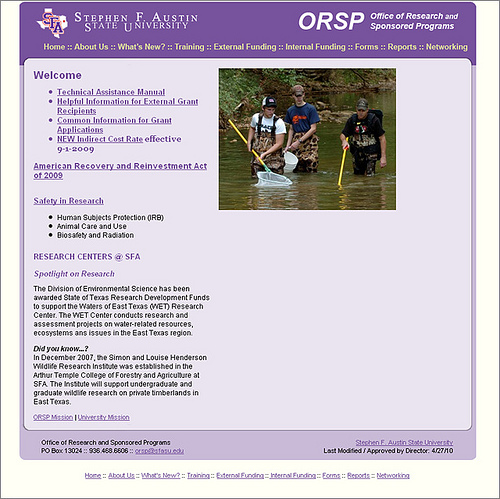 My new duties included helping the research centers on campus develop sustainability plans, assisting faculty in identifying grant opportunities, editing proposals, and designing the department's new website. While I had a bit of a learning curve with most of my new tasks, the first item I was expected to tackle was perhaps the biggest - designing and building a website from scratch. Gulp. Ugly. Dated. Information was repeated in different places, which made it hard to keep things updated and accurate. Considering we're a department that has to pay very close attention to policies, procedures and compliance, this was not only an annoyance, but a liability. When designing, I had to take into account our purpose and our audience. We needed a way to get a lot of information across in a clear and organized manner, and we needed to deliver that information to university faculty and staff, many of whom have never heard of Google, nevermind Twitter or Facebook. (I'm exaggerating, of course. Mostly.) We have a large document called the Technical Assistance Manual, and we decided to create a website that was only "three clicks deep" - each page contains generic information that explains basic ideas and concepts, and every link on every page leads to the TAM for specifics. Meaning the TAM is the only page that needs to be kept up-to-date. Not the most interesting, elegant, or innovative design, but the one that worked best for our needs. Plus it's pretty. See for yourself! 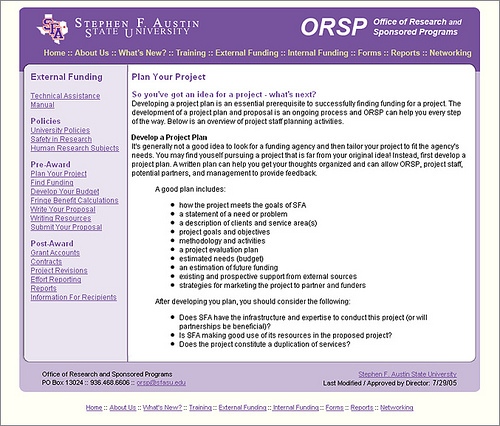 I started by looking at the websites of grant offices at other universities and stole the ideas I liked best. I then designed and built website with feedback from my department and got my very talented friend Elma (who works in Public Affairs) to create the (beautiful!) headers. I'm really happy with the way it turned out and everyone is excited to have a website that people (including us!) can actually use. And the fact that this website is connecting users to information pleases the librarian in me. Funny how things come full circle! Moral of the story: Sometimes it's okay to take on a project even if you have no idea what you're doing or how to accomplish your goals. You can fake it while you make it, and learn a bunch of new skills along the way. So the next time someone asks you to do something that seems impossible, say yes! With a little luck, a lot of work and your best friend Google, you can accomplish anything.